1 Karimu Kotun Street, Victoria Island, Lagos. FOLLY: Like with all things new and shiny in Lagos, make a reservation so they don't bounce you in the name of "we're fully booked". Luckily for us, we waltzed in sans reservation on a Sunday afternoon but we know they turned back a couple of people because they didn't have any tables. NOSA: You do what you want when you're popping, tbf. FOLLY: I found the restaurant to be tastefully decorated. NOSA: Same here. Lots of natural light too, which is great for pictures. FOLLY:I loved the wine storage display that you're greeted with when you arrive. I won't go too far as to call it a cellar as they do because it's hardly climate controlled because of the constant light that'll hit the bottles because the storage is a glass encasement. The Grill by Delis was quite pricey and we had a mental budget of N30k so we had to be a bit creative in getting a mix of dishes. NOSA: "They" only pay me one salary so I can't go wild. But I guess it's fair since they have to pay all the waiters they poached like the homeboy from Casa Lydia. Aside: they have a separate menu for outside that we shall be back to check out soon. FOLLY: We started with the Gnocchi, as a first course, and it really wasn't my cup of tea. Gnocchi is mostly potatoes, other ingredients are eggs, flour, cheese etc. The cheese used in this tasted like a hard salty cheese like Romano, which I really liked so much so that I found the sections without cheese to be pretty bland. FOLLY: I also didn't appreciate that the gnocchi wasn't very defined and had no definitive shape. It looked and tasted like clumps of potato, again except the sections that had cheese. FOLLY: I lowkey wanted to try the wagyu. However, it was N24,000 and the average person is unlikely to walk into this restaurant and order the Wagyu so I figured we'd order something that EDL readers are more likely to be inclined to i.e. a cheaper piece of meat. NOSA: That's more than one month's NYSC salary. Yeah, so I settled with the Australian Ribeye with a side of asparagus and chimichurri. FOLLY: While I settled on the Duck Fat Baby Chicken because, The Kitchenista, a US food blogger says duck fat is really tasty for pan frying. My views on how chicken should be made are a bit too problematic for this blog so I will redact them. NOSA: Lmao, if you know me in real life, you can ask me when I've been drinking. FOLLY: The chicken wasn't entirely bland but the seasoning was concentrated on the exterior. The potatoes served in this were likely also cooked in duck fat because it tasted a lot richer and oh so delicious. 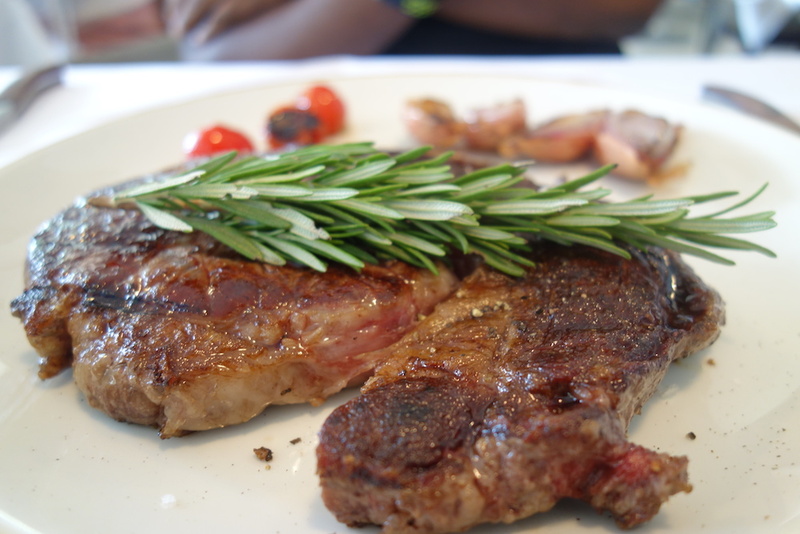 NOSA: My steak was so so delicious. This was probably one of the better steaks I've had in Lagos. Maybe the best I've had in the last year. The meat was extra tender with the right amount of chew. Oh, and you should definitely get the asparagus as a side. It looks burnt in the picture, or actually it's got a little burn, but it's very well seasoned. FOLLY: The cocktail menu looked SOLID. I am looking forward to one of the Drink Lagos contributors stopping by here for a detailed review of the cocktail menu. Maybe when Gbenga returns from his lent induced sabbatical. We were impressed. Decent amount of parking off the street in front of the restaurant building. EDL Weekender: Off Beat Live with AYE!